Representative Todd M. Smola, Republican of Warren, consulted with a colleague at the State House. 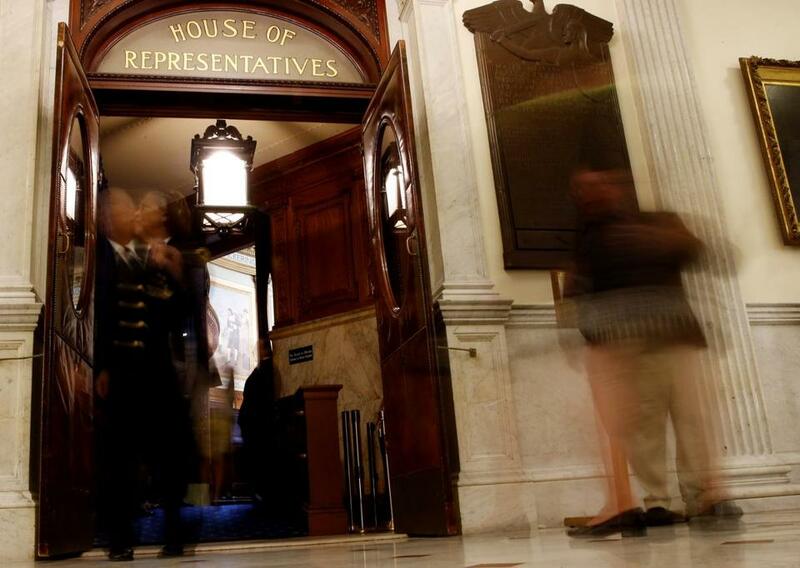 The packed agenda marked what’s become a biennial last-minute sprint to August on Beacon Hill, where lawmakers move in a flurry and — this year included — with little public debate or review of some of the session’s furthest-reaching legislation. Lawmakers wrap up their formal sessions for the year Tuesday night. 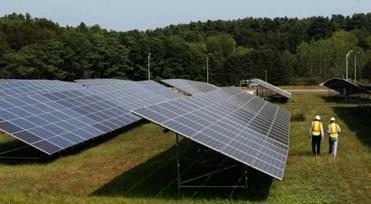 And they’re taking a pass on net metering. Compromise opioid legislation was among them, passing just hours after it was first released by negotiators. The bill includes a three-year pilot that would provide addiction treatment medications to some inmates starting in September 2019. Currently, when people addicted to opioids are incarcerated in Massachusetts, they are forced into withdrawal and then denied access to the main medications used to treat opioid addiction. This puts them at high risk of fatal overdose upon release. The opioids program would enable some inmates to have access to the medications that treat opioid addiction — methadone, buprenorphine (known by the trade name Suboxone), and Vivitrol, a once-a-month shot. The Houses of Correction in Franklin, Hampden, Hampshire, Middlesex, and Norfolk counties would provide the medications to inmates who already had a legitimate prescription when they arrived, and they would provide them to opioid-addicted inmates nearing release. Hampden and Franklin Counties already have programs providing buprenorphine to inmates. Middlesex County Sheriff Peter J. Koutoujian, president of the Massachusetts Sheriffs Association, said Tuesday night that sheriffs in the five participating counties had asked to be part of the pilot. “They’re excited about this opportunity to provide medication-assisted treatment for a population in great need,” he said. The bill also puts requirements on the state Department of Correction, which runs the prisons for people with longer sentences. Starting in April 2019, the department will have to provide the medications at four of its facilities — the two women’s prisons, MCI Cedar Junction, and a Plymouth treatment program for civilly committed men. Negotiators ultimately pulled back on one of the thorniest parts that had been considered in the multifaceted legislation. Baker wanted to give medical professionals the authority to hold addicted people against their will for up to 72 hours in a treatment facility, if the person was in danger of harming themselves and others. The House had rejected the idea altogether, while the Senate proposed a scaled-back version to allow temporary involuntary commitment of addicted people only when courts are closed for business; the bill would require a judge to make the decision that the person can be committed. The Senate also had considered, but ultimately rejected, a highly controversial plan to open a “supervised injection site,” where illicit-drug users could inject in a clean and safe environment, knowing that medical professionals are on hand to revive them if they overdose. In its place, it backed a provision to establish a commission that would engage municipal leaders and others in studying the concept. That provision remained in the final bill. A woman called out roll call as lawmakers stream into the House of Representatives on the last day of the Legislative session at the State House. Despite the changes, the bill includes several of the provisions Baker had originally sought, including the creation of a commission tasked with recommending credentials for recovery coaches — people who are in recovery from addiction and help others in that struggle. It also mandates that all prescribers convert to electronic prescriptions for controlled substances by January 2020. Lawmakers, however, were unable to find common ground on other measures, including health care. A House proposal would have applied $330 million in new assessments on insurers and large hospitals to funnel money toward community hospitals. It also included new assessments on urgent care centers, retail clinics, and surgery centers, requiring such clinics to pay 8.75 percent on the total amount they charge commercial insurers. The approach drew a torrent of criticism from business and health care industry groups that said the legislation would raise costs. The Senate, meanwhile, opted to set a “rate floor” for insurance payments to help the hospitals. It would mandate that they be paid at least 90 percent of the average price of a medical service. It also would have required some large hospitals to pay hefty penalties if spending rises too quickly. State Senator James Welch, who also served on the conference committee, said he was disappointed and blamed “big dominant players” in the health care industry for working to derail a compromise bill. “We passed our bill in November of 2017, so there shouldn’t be any misunderstanding of who was committed to this legislation,” he said. The House and Senate also tried unsuccessfully to reach an agreement on how to revamp the state’s school funding formula. The negotiations, which started in a closed-door conference committee last week, had come after a report, released last month, said that Beacon Hill lawmakers have been shortchanging the education of the state’s students by nearly $1 billion a year. In the early hours Wednesday, lawmakers did manage to finalize a $1 billion economic development bond bill that establishes a two-day sales tax holiday on Aug. 11 and 12. It also includes a Senate proposal that would ban noncompete agreements for lower-wage hourly employees and student workers, limit them to one year for other workers, and bar companies from enforcing them against people they have laid off. Baker has 10 days to act on any of the bills once they reach his desk. 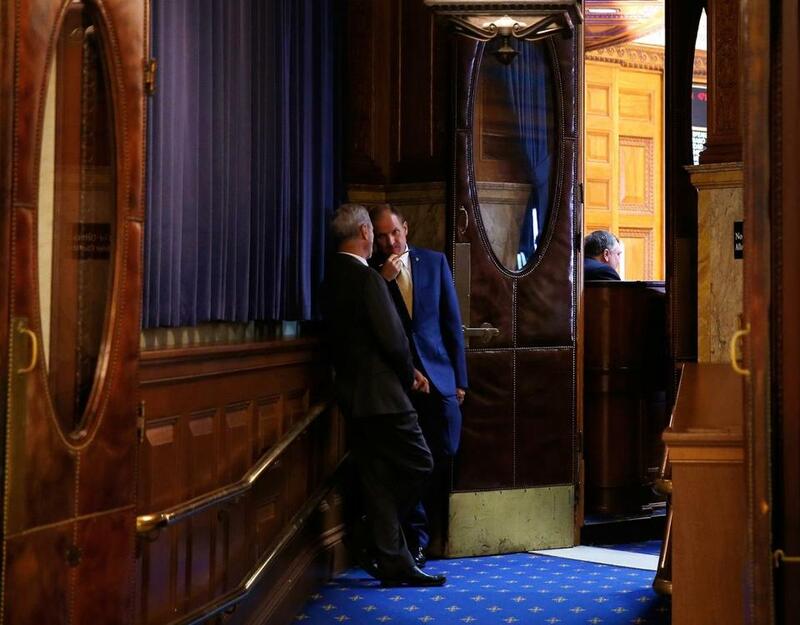 Layered onto the late-session frenzy were rapid-fire budget overrides in recent days and votes on amendments Baker added to the state’s recently signed $41.7 billion budget. The Legislature also moved to restore a budget section that offers a discount on highway tolls to drivers who commute during off-peak hours. The Senate and House both rejected a Baker budget amendment that instead called for a broader study on traffic congestion. The move returns the proposal to Baker in its original, legislatively passed form — but it could be fruitless. With its formal session finished, lawmakers now have no recourse if Baker decides to veto it. 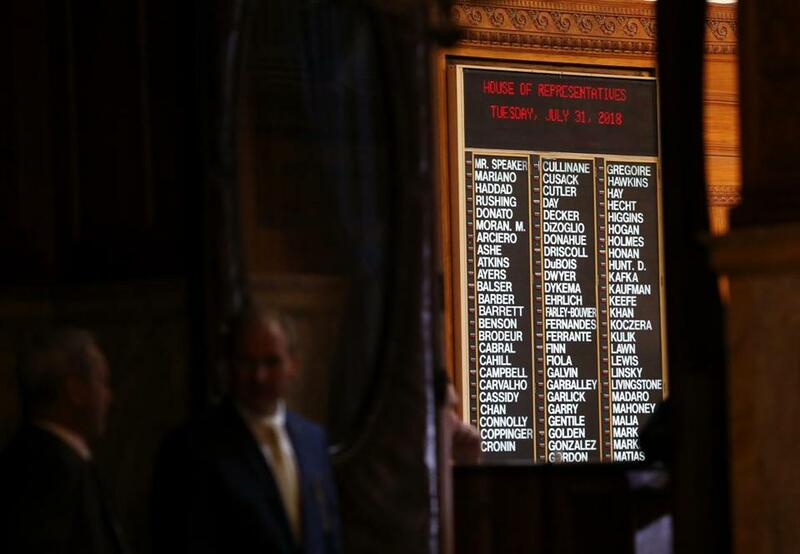 House lawmakers were listed on the board Tuesday, the last day of the session. Jon Chesto and James Vaznis of the Globe staff contributed to this report. Matt Stout can be reached at matt.stout@globe.com. Follow him on Twitter @MattPStout. Felice J. Freyer can be reached at felice.freyer@globe.com. Follow her on Twitter @felicejfreyer. Priyanka Dayal McCluskey can be reached at priyanka.mccluskey@globe.com. Follow her on Twitter @priyanka_dayal.